Larger fold up pocket stove. Steel. Paramount when light weight and small size is needed. Folds To 5" x 5" x 1" (inches). GI Government Issued style. Great item for backpacking, bicycle touring, camping, hunting, fishing, military personnel, and much much more. Portable commando cooker. Weighs 0.25 lbs. Stove only. Does not come with Fuel cubes or canned fuel. Depending on a variety of factors, there may very well be times you want to have a means to warm up food, as well as your fingers and toes, but can't have a roaring campfire going. 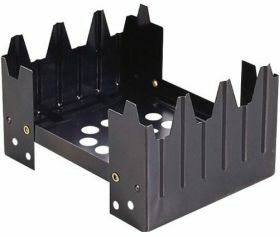 Sure, there are a few ways to have a fire and yet remain unseen but with a folding pocket stove like this, there's no need to go to all that trouble. This stove isn't just for covert cooking though. It is great for backpacking, camping, bike tours, hunting, or fishing. Think of it like a small, portable campfire that is always ready to go. At just a measly four ounces, you'll not notice much of any added weight in your pack. It folds to a 5" square, just an inch thick. Small enough to fit into a side pocket on your cargo pants or shorts. When you unfold the stove, you'll immediately notice the rugged steel construction. This is the same style pocket stove as is issued to our military forces. Set it on a reasonably flat surface and light the fuel cube or canned fuel (not included). Place your camp kit pot or pan on top and within mere minutes you'll have a hot meal. The stove is stable and as long as you're not trying to balance it on a pile of loose rocks, you'll not have any problems with pans tipping over on it. To be honest, many people have problems cooking over a campfire. There is something of a knack to it that must be learned. With this pocket stove though, the learning curve is pretty quick as it is very much like cooking over a gas burner at home.